Looking for a party to remember! Awesome Teepee tent parties and out door movie nights for Boys & Girls!! We also offer the most stunning glamour picnics! Attention to detail is what makes Teepee dreamerz Teepee tent parties stand out! Our sleepovers with style are a treat to remember for a life time! Each child will receive their own designer teepee tent and bedding which includes bunting and themed cushions. Creating a dreamy atmosphere that children will remember forever. 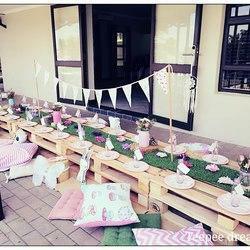 Each party is unique and packages include, delivery, styling and collection, making this a no fuss option for busy moms!! We have many add on extra's to choose from such as dream catcher kits, personalized robes, cakes, cushions and party packs. The perfect party for boys and girls!! Why not have a camp out or pamper themed sleepover or outdoor movie night! Children will remember this for years to come! Our glamour picnics are perfect for any age or occasion! Celebrate Life! I'm looking forward to turning party dreamz into reality! Mel, thanks for the most amazing unicorn sleepover experience. Alice said, "It was the best day of my life!" Your creations and your professionalism are phenomenal, second to none, and your passion for what you do really shines through. I know that anyone using your company for his/her child's party will only be completely satisfied! Thanks for your time and all your efforts to make everything so perfect. Teepee Dreamerz comes highly recommended. The moment you give Mel from Teepee Dreamerz a call, you know you are in great hands! She is friendly, helpful, efficient and has such a magnificent imagination.... that every last detail is just perfection!!! 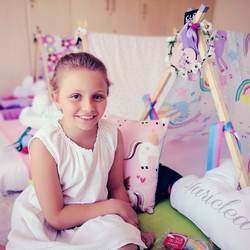 My daughter & her friends had the most beautiful sleepover party thanks to Mel, I think the girls (and their Moms) couldn’t believe their eyes when they saw how Mel had transformed an ordinary bedroom into a Magical Unicorn Wonderland! Thanks Mel, for making my daughters dream come true! You are inspirational!! An ordinary room was transformed into a magical, dreamy place for these little girls! Thanks for the excellent service, great ideas and advice!! They get my recommendation for sure. Phenomenal! You guys are great - you came through at the last moment, you made it magical and the girls absolutely LOVED the layout you created for them. Thank you Teepee-Dreamerz for the most wonderful and memorable party. I can highly recommend them. Their professionalism and attention to detail was very refreshing. Thank you Mel for making India's 9th party, her best party ever. Thanks Mel for creating such an amazing party for Abi. It was one of the best parties we've had. Abi and her friends loved the tents and the themed decor. 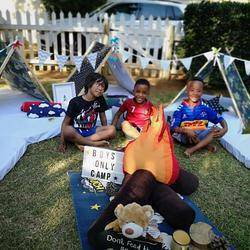 Thank you Mel and Teepee Dreamerz for creating such a magical and memorable Teepee pyjama party for Magical Moments and the precious 13 children we gifted from a day care centre based in Tembisa and two toddlers from Impilo. A day for us all to treasure. You gifted us all with the Extraordinary. May your delightful and enchanting business flourish! You are welcome to return to Sandhurst for many pretend sleep over parties for other children too. We have such a magnificent Home of Distinction - it's like no other in the Land. It's filled with immeasurable kindness and magnificence. And so much fun too! Thank you to SOGO Organic for your healthy ice lollies which the children loved and the stunning Teepee cookies from Ovenly Love, organised by Mel for our party. Much gratitude to you all! Everyone came to the Party! Even the sunshine came out to play. In the absence of sunshine, there was an abundance of Light. In the absence of electricity, there was Power, beyond measure! I would book a teepee party for any occasion - for all ages. Adults too. Life is about moments. Moments become memories. Create them. As often as possible! Highly recommend Teepee Dreamerz!! Mel is incredibly creative and puts together the most special parties for his and boys. She is an original. The ideas she comes up with are so amazing. So if you are looking for something extraordinary and filled with love in every detail plan a party with Mel. The most amazing party! It was the highlight of my son's year!! Thank you so much Mel - Teepee Dreamerz for making memories to last lifetime. An absolute must for any child to celebrate their birthday. The tents are gorgeous with stunning themes and comfy mattresses. Teepee Dreamerz have a wide variety of extras to make your little ones day extra special, they really go the extra mile! A wonderful party idea! Mel's attention to detail and the love and care she puts into parties is so special and memorable. Beautiful quality teepees and accessories. A party dream.